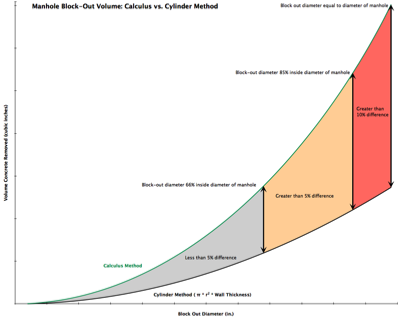 Manhole Blockout Volume | Calculate the precise weight of a hole made through a cylinder wall. Barger, Eric. 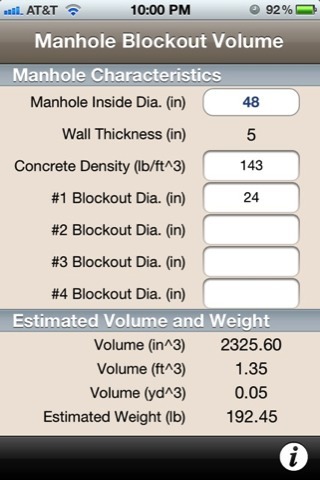 “Precast Math Tools: How to Calculate Manhole Block-Out Volumes,” Precast Inc. (July/August 2012): 30-31. Manhole block-out integral. See the math behind the article. 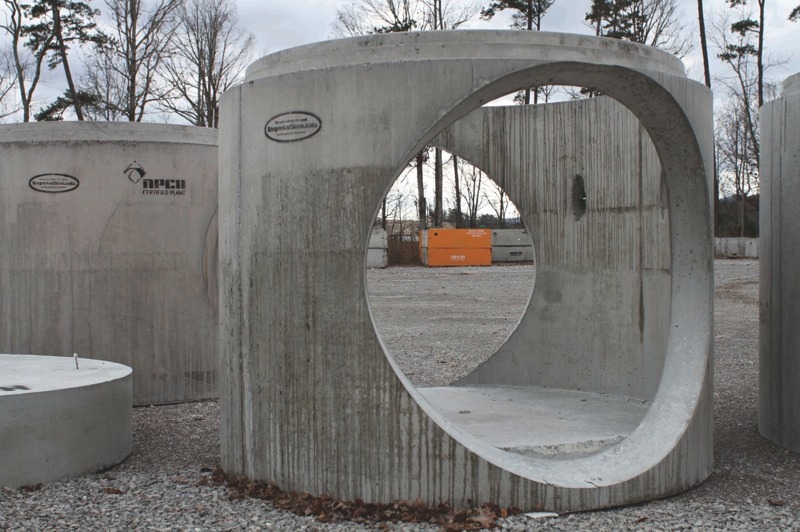 A common calculation in precast concrete manufacturing is determining the volume of a round block-out in a manhole wall. A round block-out is a hole either cast or cored into the side of a manhole wall (see photo). Mathematically, there are several methods to calculate this volume, ranging from a simple geometric formula to the theory-intense calculus method. The complex shape made by the block-out requires the use of upper-level mathematics and/or 3D CAD, which are two of the few means for precisely calculating the volume of the block-out. Even armed with the calculus formula or 3D CAD, a specialized computer program or calculator that can solve integrals will be needed to calculate the final value. The key word in this approach is calculating “precisely”. A 5% error between the cylinder formula and calculus method manifests itself once the diameter of the block-out reaches 65% of the inside diameter of the manhole. The error then continues to grow to over 9% when the diameter of the block-out reaches 85% of the inside diameter of the manhole. This difference in volume between the two methods is small when looking at the difference in weights. The cylinder method is still close enough to continue to use for block-out weight approximations. Left: A photograph of a storm manhole with two large block-out holes cast in the structure. The formula for a cylinder (π r 2 h), where the r is the radius of the block-out hole and h is the wall thickness, can be used to approximate the volume of a block-out. This will be referred to as the “cylinder method” and is close enough if you need a quick and easy calculation. The “calculus method” uses a triple integral to determine a precise volume. The calculus method must use specific software or certain scientific calculators to solve for a numerical answer. Using these tools, an equation can be derived specific to each manhole for different size block-outs. Utilizing these formulas, it is possible for anyone to get more precise answers than with the cylinder method. When coring or using a block-out to form a 12-in. diameter hole in a 48 -in. inside diameter (I.D.) manhole, it makes little difference whether the cylinder formula and calculus method is used to solve for the volume. However, change the block-out size to a 36–in. diameter hole in the same 48–in. I.D. manhole, and the difference in volume between the cylinder formula and the calculus formula starts to differ significantly as shown in the following examples. Calculate the volume for a 12–in. diameter hole to be cast or cored in a 48–in. I.D. manhole with a 5 in. wall thickness. Calculate the volume for a 36–in. diameter hole to be cast or cored in a 48–in. I.D. manhole with a 5 in. wall thickness. Then there are the tapered block-out holes and there is a calculus formula for that as well; however, there is also an even simpler method. If you have a block-out that tapers from 26 in. to 24 in. diameter, solve for the average of the two – 25 in. diameter – in this case. Using the average diameter will produce an accurate approximated volume. Comparing the results of the two examples, one can note the volume difference between the cylinder method and calculus method. The cylinder method is and will continue to be the fast and easy method to getting a quick volume that is close enough. Having said that, the actual difference in weight between the two formulas could be as much as 1,000 lbs. when considering an 8-ft round manhole with two large-diameter block-outs. 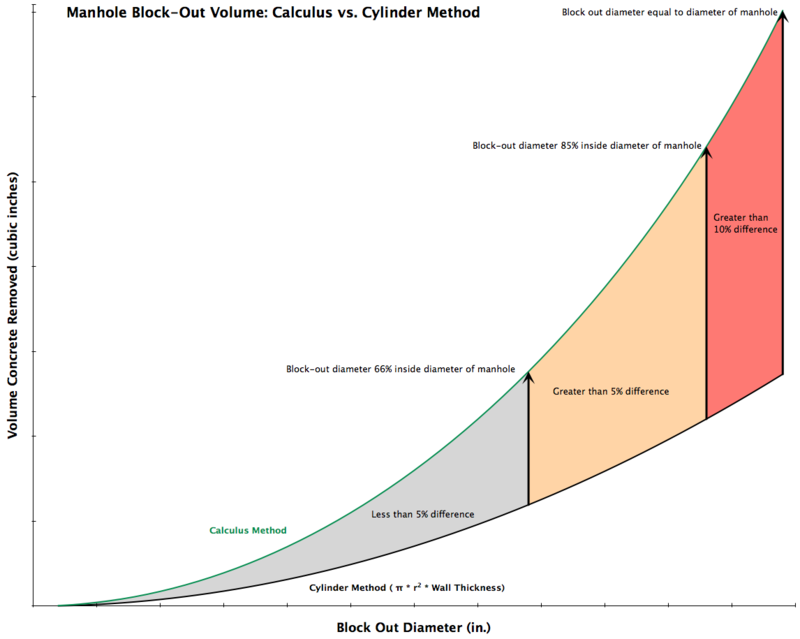 Admittedly, there is not a significant weight difference between the two formulas throughout the normal range of block out sizes on most manhole sizes produced. For those who desire to calculate precisely how much concrete is removed due to a block-out, the difference may seem more significant. The derived equations for each round product line are listed below. These equations deliver answers that are very close in volume but not exact. The equations should yield answers that are accurate to within 1% of the actual volume. In addition, if you just want a chart to use and not worry about a calculation, a chart with precise volume calculations using the calculus method is shown in the nearby chart. Click here or on the below chart to view larger PDF version.